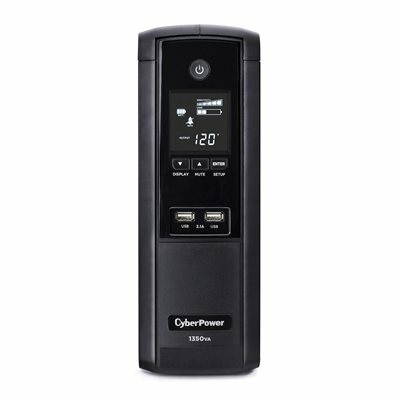 A mini-tower UPS with line interactive topology, the CyberPower Intelligent LCD Series BRG1350AVRLCD provides battery backup (using simulated sine wave output) and surge protection for desktop computers, workstations, networking devices, and home entertainment systems. The BRG1350AVRLCD uses Automatic Voltage Regulation (AVR) to correct minor power fluctuations without switching to battery power, which extends battery life. AVR is essential in areas where power fluctuations occur frequently. Two USB charge ports (2.1 Amp shared) rapidly power portable devices such as mobile phones, MP3 players, and cameras. Even brief power outages can result in data loss or hardware damage. This UPS system provides enough emergency backup to keep your devices running during momentary outages, and enough runtime power to close files and properly shut down your electronics during extended outages. It also safeguards connected equipment from storm-related power surges, activity on the power grid, or high-powered equipment turning on and off. 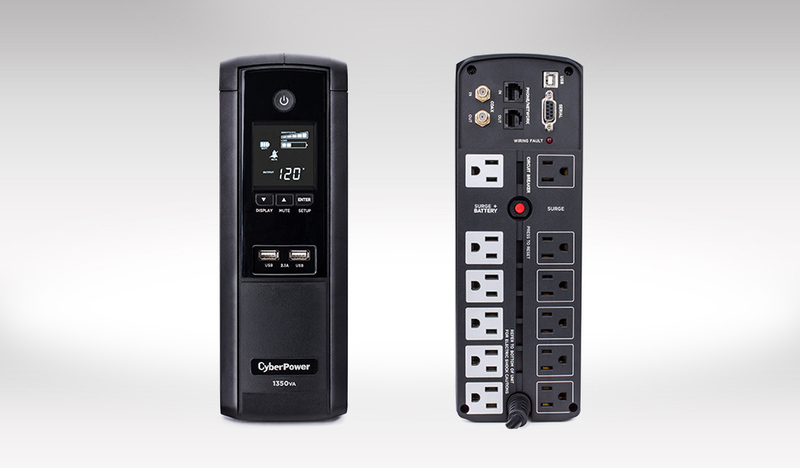 CyberPower will repair or replace a defective UPS system within five years of purchase. See user manual for details.